Excellent sample cover letters to get the job you want. Select the right one for you. A resume without a convincing cover letter makes little impact and will probably land up in the trash can. 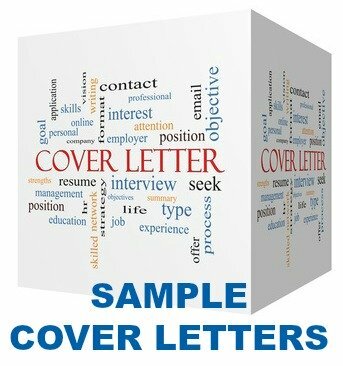 A specific, personalized cover letter that highlights your suitability for the job will grab the reader's attention and ensure your resume gets serious consideration for the job opportunity. Research has shown us what works when writing a cover letter and what doesn't. These sample cover letters, each designed for a specific job type, use these key criteria to provide a practical and persuasive example. Keep it to one page in length. The reader does not have time to go through pages of text before deciding whether to look at your resume or application. They want a cover letter that is to the point and easy to read. Get the readers attention straight away. You can do this with the appearance and layout of your letter. It should be in a clear and easily readable font, well laid out, and if you are mailing your letter use good quality stationery. Customize each cover letter with a proper address, do not use To Whom It May Concern. Cover letters are most effective when addressed to an individual. Personalize the greeting by getting the name of the reader. Call the company and get the full name and correct spelling of the recipient. Addressing the letter to someone by their name grabs their interest. State your objective in the first paragraph to keep the reader's interest. Why are your writing this letter? What is the benefit of reading this letter for the recipient? Build an immediate connection to the reader. The second paragraph is the right place to highlight your specific skills and abilities and how they meet the requirements of the job opportunity. Summarize why you are the right person for the job. Relating your strengths to the needs of the company and the job immediately indicates that you have spent time thinking about the position. Keep it short and to the point so that you don't lose the reader's interest. Your closing should also be concise. Make a strong closing statement and motivate the reader to take action. Let the reader know what you want - an interview, an opportunity to call. Explain when, where and how you can be contacted. Select the cover letter sample you need and rework it for your own requirements. Find practical and productive job search tips here. Make use of these cover letter samples to get your job application noticed.